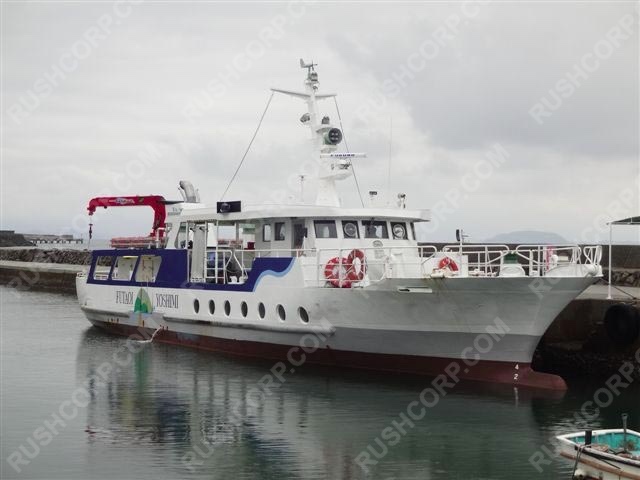 LOA: 26.00m, LengthRegistered: 23.26m, Breadth: 5.00m, Depth: 2.00m, Crew: 4, Passengers: 80, Service Speed: 11.5, Main Engine: Yanmar 6LX-ET3 770ps, Auxiliary Engine: Yanmar 4CHL-N 50ps x2, Auxiliary Engine 2: Yanmar, Speed-Consumption: 110L/Hr, Propeller: FPP, Notes: 80 passengers plus Cargo. Unic Crane fitted. Bow Thruster fitted. Maintained in very good condition.